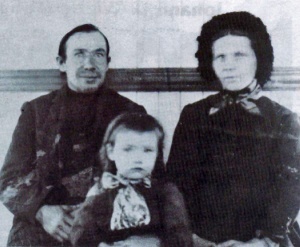 Jacob D. Wiebe and Helen (Funk) Wiebe with daughter Agatha (b. 1905). Preservings photo. Jacob D. Wiebe, farmer and entrepreneur, was one of eight surviving children of Bishop Gerhard Wiebe (1827-1900) and Elizabeth Dyck (1828-1876). He was born on 4 January 1865 in the village of Heuboden, Bergthal Colony, South Russia. Jacob immigrated to Canada in 1875 along with his parents and siblings. They settled in the village of Chortitz on the Manitoba Mennonite East Reserve. Jacob was baptized on 2 June 1884 and the following year married Helen Fleming of Minnesota, USA. Unfortunately Helen died in 1887 leaving no children. Jacob married his second wife, Helen Funk (1867-1954), in 1888 and together they had five sons and four daughters. In addition to farming, Jacob ran the village post office out of his home until his son Gerhard took it over. He also owned and operated the first general store which was eventually taken over by another son. Jacob was the first in the village to own a Model T Ford and after selling the farm in 1927 and moving to Niverville he began raising Angora rabbits as a hobby. As his health began to decline, Jacob was nursed at home by his daughter Helen. He died in 1938. Peters, Helen Unger. "Jacob D. Wiebe (1865-1938)." Preservings No. 6 (June 1995): 9-11. Brown, Sharon H. H. "Wiebe, Jacob D. (1865-1938)." Global Anabaptist Mennonite Encyclopedia Online. March 2006. Web. 25 Apr 2019. http://gameo.org/index.php?title=Wiebe,_Jacob_D._(1865-1938)&oldid=93917. Brown, Sharon H. H. (March 2006). Wiebe, Jacob D. (1865-1938). Global Anabaptist Mennonite Encyclopedia Online. Retrieved 25 April 2019, from http://gameo.org/index.php?title=Wiebe,_Jacob_D._(1865-1938)&oldid=93917.